So as I mentioned in my last post, I bought a sous-vide precision circulator a few weeks ago. This was after spending Thanksgiving in Arkansas with good friends. I was cooking up a storm with my friend Vince, Chef/Owner of Bouchee in Fayetteville, AR, and having a blast! He had brought his sous-vide device with him and he showed me how to cook with it. He introduced me to the website ChefSteps (which is a fantastic!!). They have online classes, some are free, some for a nominal fee. They offer a beginner sous-vide course that is free, and awesome. It’s called Cooking Sous Vide: Getting Started. They even show you how to cook sous-vide without any of the fancy equipment. Courses and directions are offered with a combination of writing, photography, and video which makes everything very easy to follow. Plus the chefs are are vey easy on the eye – I’m just sayin’! 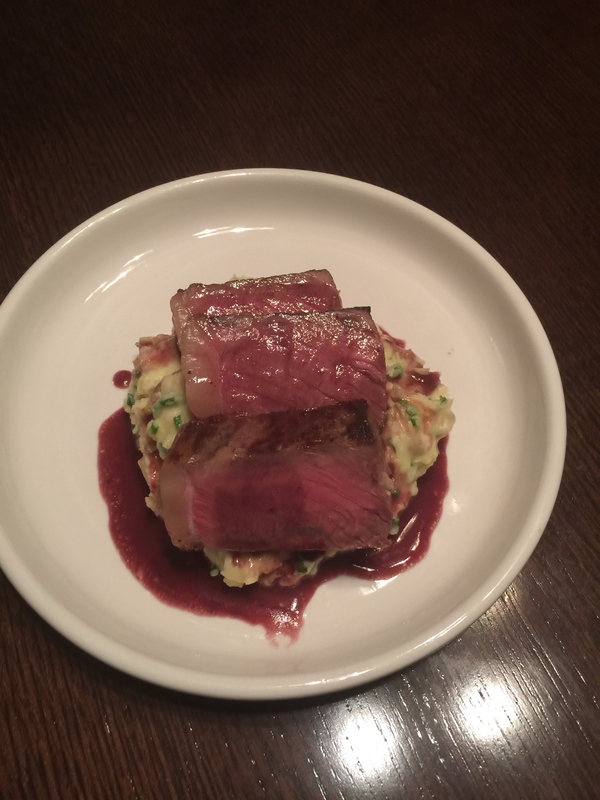 One of the recipes in the beginner course is Steak with Red Wine Sauce and Smashed Potatoes. It looked so amazing when I watched the video that my mouth started to water! I decided right then and there that I was going to make that as my first venture into the world of sous-vide cooking. Before I go any further, I want to be clear that these websites and products I am using are my own personal opinion/choices gained from my experience with them. I don’t get paid to endorse any of these things, I just want to share the experience with you and let you know what I have found helpful and effective. To be honest, when I first heard about sous-vide several years ago, I turned my nose up at it. I thought it was gimmicky and a fad that would fade away quickly. It is now a technique used in most of the finest restaurants in the world because it delivers consistent, quality results time after time. This works especially well with steaks, fish and chicken. Because the temperature of the water is the temperature of doneness you want in your steak, or whatever you are cooking, there is little to no risk of over cooking. In an oven or in a frying pan the temperature is far higher than you want the final temperature of what you are cooking to be so you have a small window to remove it from the heat before it overcooks and drys out. It is quite honestly one of the best steaks I have ever had in my life. The texture of the meat is so tender and juicy and the sauce has just enough vinegary-ness from the red wine to take it to the next level. Serving it over the Smashed Potatoes made with fingerling potatoes with the skins left on and folding in fresh chives at the end transcends it to heavenly. Notice in the photos that the medium rare cooking temperature of the meat is almost edge to edge of the steak. There is a little more doneness at the edges due to the searing before and after the sous-vide cooking. The edge to edge doneness and texture of the meat is one of the key benefits of sous-vide cooking. If you want the steak cooked more, you choose a higher temperature for the water bath. There are charts to help you determine temperature and time on ChefSteps and many other sites and cookbooks. I hope this inspires you to give sous-vide cooking a try. i promise you that you will love the results!